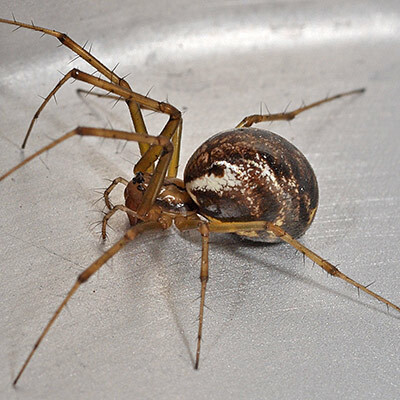 Linyphia triangularis, more commonly known as the Common Hammock Weaver, is usually found on lower bushes and vegetation in a range of habitats including gardens. The female is about 6 mm and the male slightly smaller at 5 mm. It is a small but well-marked spider with a tuning fork shaped mark on the carapace behind the eyes. It spins a very noticeable horizontal sheet web (hence the name Common Hammock Weaver) and awaits the arrival of prey in an upside down position on the under side of the web. The species is adult in late summer and autumn. Common and widespread in much of Britain, but scattered in northern Scotland and some other areas.